Here’s an easy, kick-off-the-weekend recipe – actually an classic Italian combination (salsiccia all’uva), which marries the full-flavors of pork sausage seasoned with Italian spices and sweet grapes. It’s such a simple dish, you really don’t need a recipe, yet hundreds of variations abound on-line. 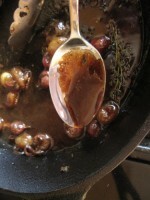 The essentials are sausage, grapes and balsamic vinegar, which are are the only three ingredients Mark Bittman uses in his rendition. Another favorite cooking star icon, Ina Garten, adds several tablespoons of butter and Chianti to the trio. How can that buttery goodness fail to please? She also cooks the grapes on the stovetop and roasts the sausages in the oven. I choose not to use butter as the sausages impart a marvelous porky fat flavor. I also cooked everything in my cast iron skillet on the stove top, further simplifying the recipe, and added cippoline onions. I’m fairly certain the 18-year-old aged balsamic vinegar I used took the simple preparation from very good to great, enhancing the sauce that resulted from the oozing grapes, pork fat and thyme. I wish I’d thought to make a creamy polenta; it would have been a marvelous sop for the sauce. Crusty Italian bread sufficed. Heat a large, heavy-bottomed skillet over medium heat. Place sausages in dry skillet and cook, turning occasionally, 20 minutes. When golden brown on all sides, prick each sausage with the tip of a knife in two places. Let juices run into pan then remove sausages and reserve. 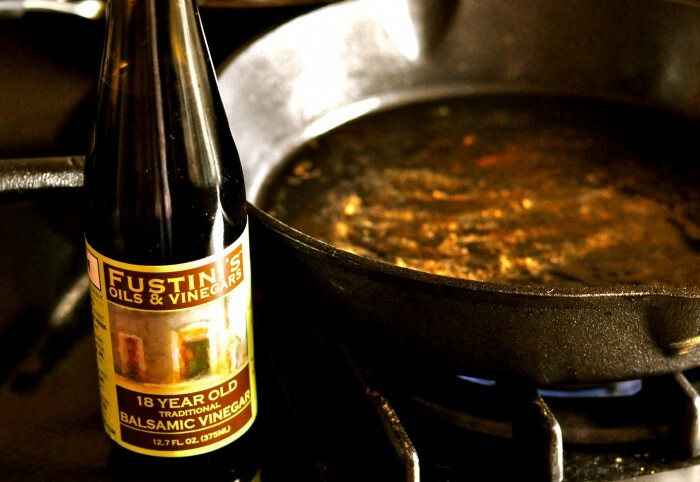 Increase heat to medium high and deglaze, stirring, with balsamic vinegar. Add grapes and cook 10 minutes, then add onions. 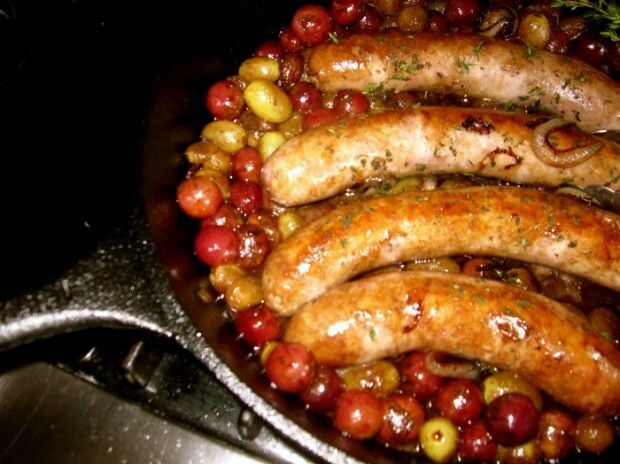 Check sausages for doneness; if they are still pinkish in the center, return to skillet and continue cooking with grapes until grapes are beginning to collapse and sausages are cooked through. In the last few minutes of cooking time, add thyme. Serve with pan juices. More Recipes Filed Under "Pork"